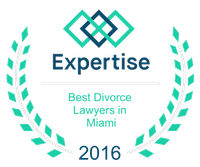 How Divorce Effects Children | Miami Family Law Lawyers Vilar Law, P.A. A Family Law Attorney means many things - someone that handles divorces, discovers assets that need to be equitably divided amongst spouses that are dissolving their marriage, and a person capable of compassionately assisting someone through the difficult legal aspects involved with a divorce. Statistics show that 50% of all marriages end in divorce, and nearly 66% of all second marriages end in divorce. Also, it's been estimated that a divorce can cost upwards of $20,000 (depending on the type of divorce), which only adds to the frustration surrounding the entire process. The "hard" legal and financial matters are neither easy, nor devoid of emotional issues. A skilled Family Law Attorney knows how to sensitively help a person through these matters, deftly resolving the more complicated legal aspects of a case, while easing fears and worries. Unfortunately, a matter that cannot be quantified, or fully appreciated is how a divorce effects children. There is no way of fully understanding how a divorce is internalized through the eyes of a child. To them the entire foundation of what they have always known as their family is being erased, and a skilled Family Law Attorney does everything they can to educate their clients how the divorce will impacts their children. At VilarLaw the education process begins by sharing 4 pamphlets with our clients: Common Errors in Divorce with Children, Love Isn't Easy, Rules, and Truth or Consequences. It is our goal to insure a strong bond can be maintained with both parents when possible. After that, it is a matter of applying 20 years' worth of legal expertise in handling Family Law cases. That means clients, and their families, know they'll be represented by an Attorney that can make a difficult process, that especially effects children, as painless as possible, while taking into consideration the people involved - not just the legal matters. Contact the VilarLaw Offices at (305)373-8000, to schedule a consultation. Make the child give money or messages from one parent to another and putting the child in the middle. Ask the child to hides something from the other parent and in effect teaching them to lie. Interrogate the child about what is happening in the home of the other parent and therefore turning the child into becoming a spy and into gossiping. You should not say nasty things about the other parent to the child or in the presence of them. Treat Matters involving parents in exchange for visits. Those moments are extremely tense for many, sometimes this causes the child to feel like they are living in the air. Show a long sad face when the child goes from one parent to another, thus teaching the child to be unfair. Tell the child who wants a new toy or want to do something that costs money and then tell him or her : "Ask your father because he does not pay me enough child support" or " Ask him to your mother because I give enough money for child support and she waste it". Ask the child directly or subtly, "which of the two parents you really want to live with? ", Thereby putting emotional weight on child. Allow the child to take possession of the situation whenever he or she so desires. Directions: It is time to take the lead and own up to the truth about your behaviors. Read the following and identify ALL the behaviors you have chosen to act out. Remember that children experience a loyalty bind whenever they are placed in the middle of their parents' conflict. This will make them feel uncomfortable loving both of you. - Put an X on the number that indicates a behavior you have exhibited in the past, but you no longer do. - Circle the number that indicates those behaviors you are currently choosing to do that hurt your child. I make negative comments about the other parent. I use negative body language or tone when referring to my child's other parent. I allow relatives or friends to make negative comments when my child can overhear. I ignore my child's presence while arguing with the other parent. I discuss the character defects of the other parent when my child can overhear. I stress to my child how much I miss them when they are with their other parent. I say a negative thing or things about someone my child cares for. I discuss child support or the lack of money with my child. I ask my child to do things or keep secrets that might feel like spying. I refuse to let my child take important items to her other home to show the other parent. I imply that I am better than the other parent. I send child support checks, letters, or verbal messages through my child. I make my child feel responsible for my emotional needs. I let my child take care of me. I imply that my child is not safe in some way when she is with the other parent. I block my child's contact with the other parent (phone calls, visits, etc.) or us screening methods to avoid their calls.